Please click here to go directly to our Equity Rules article in PDF. Increasingly, talent-driven organizations use equity models as a key differentiator to win the war for top executives. Private companies, in particular, are crafting innovative equity models that combine a variety of tools, such as restricted stock, hybrid loans, profits interests, synthetic equity and zero cost transfers of equity. Often, these ownership plans make a material difference in a company’s ability to attract, retain, and reward co-owners, as well as key executives. Innovative equity models can combine restricted stock, hybrid loans, profits interests, synthetic equity and zero cost transfers of equity. Affordability: "Our success has driven up the price of ownership. Key executives can’t afford to buy in and we may lose our best people." Competency: "Our core markets and strategies are shifting fast, and we don’t have the right people in place. We need to realign our leadership." Succession: "Some of us are ready to retire, but our equity model is getting in the way of our exit strategies. Our succession plan is at risk." Left unanswered, challenges such as affordability, competency, and succession can trigger equity inflection points, a term coined by the late Andy Grove, former Chairman of Intel, to describe an urgent and significant change that must be addressed to ensure a company’s future. Owners and boards can employ a number of value-sharing best practices to anticipate and navigate inflection points, and avoid crises that can threaten talent-driven companies. We call these best practices the Equity Rules. One of them, Sell·Pay·Convey®, provides a powerful decision framework for crafting highly-effective equity models for the sharing of value across and among top talent. Attracting, retaining, and rewarding key talent in the service economy is not only an art, it is a strategic advantage. The Equity Rules and the Sell·Pay·Convey decision framework detailed in the following pages can assure and foster private company success. Owners and boards can employ a number of value-sharing best practices to anticipate and navigate inflection points, and avoid crises that can threaten talent-driven companies. Upshot Engineering (disguised) is an example of a company challenged by equity inflection points. Founder Bill R. has guided his company through more than a few government contracting cycles, and he is ready to take a more passive role in the company. But, defense spending is winding down, and Bill’s advisory board is telling him that the best prospect for near-term growth is consolidation, scale and cost savings. Bill needs a savvy, energetic co-leader to help him drive growth via acquisitions and eventually assume the reins. But how can he successfully recruit this new leader, and ensure that the leader will stay the course and deliver superlative performance? There are affordability triggers that occur when an ownership stake in a company becomes too expensive for new leaders and leadership candidates to buy. There are competency triggers that occur when the strategic needs of a company require new leaders in order for it to survive and grow. There are succession triggers that occur when the current leader-owners of a company want to retire or leave for other reasons. In public companies, the equity options for navigating equity inflection points are relatively simple: stock options, restricted stock, or RSUs (restricted stock units) redeemable in secondary markets. But private, middle-market companies with revenues of $25 million to $1 billion operate in a more complex equity environment. Their owners have many more alternatives for equity transfer than their public company peers. These conditions make navigating equity inflection points more challenging. And too often, owners are unaware of their value-sharing alternatives and default to the limited selection of public company options. When owners make the wrong choices at equity inflection points, equity models become misaligned with leadership objectives. Incentives become disincentives and motivated leaders become demotivated. 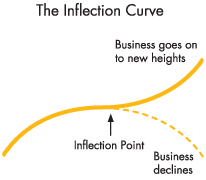 Equity inflection points can become company crises, especially when leadership changes are involved. Talent exits: Too many equity programs pay out only on separation. The result: Retention is impaired and key executives leave the company to lock in gains. Unjust enrichment: When a founder is redeemed at death or disability, the buy-sell terms of shareholder agreements can inadvertently result in accretion to minority owners. Growth capital drain: The tax consequences of equity transfers can siphon off funds that are needed to grow the company. The risks and negative consequences inherent to the design of equity models and the navigation of equity inflection points can be avoided by following five rules. Many business owners and boards turn to equity as the default technique to attract, retain, and reward senior members of their team. But equity is not always the best solution: Among other things, it may not be the best alternative depending on what an owner is trying to reward. For instance, equity awards support “all-for-one and one-for-all” environments, but they are less effective as rewards for individual contributions, such as improvements in a function or business unit. Further, while equity is a good reward for growth in enterprise value, it can end up rewarding executives for the accretive or dilutive effect of changes in capital structure unrelated to performance such as redemption of key owners. So, the first rule of equity is to confirm that equity, as opposed to an alternative, such as synthetic equity, is the right tool for the task at hand. Growing companies often seek to preserve cash by using equity instead. Still, equity is often the most expensive value-sharing alternative available to owners, and it entails a near-permanent transfer of value to an executive. Thus, it usually is not the best option for rewarding growth over a limited period of time. Further, equity is property, which precludes any tax deduction when stock is bought back by the company. Conversely, cash-based awards and synthetic equity follow the rules of compensation – meaning that upon settlement, the company can almost always deduct the costs of these programs. So, the second rule of equity is to understand the full cost of an equity program across its lifecycle. Prior to adopting an equity program, owners should evaluate its fit with their anticipated exit paths (see exhibit 1). Different exit paths are best served by different reward strategies. If owners plan to sell the company to insiders, an equity program may be appropriate. But if, for instance, a family-run business plans to keep the business in the family, intra-family trusts may be a better alternative than equity. So, the third rule of equity is to ensure that it aligns properly with the owners’ exit strategies. Frequently, boards and CEOs ask us to develop an equity plan to overcome a lack of executive engagement. Unfortunately, if an executive team is not intrinsically motivated, throwing equity at the problem is not an effective solution. As Alexander Pepper says in his book, The Economic Psychology of Incentives, owners should focus first on ensuring that their executive teams are treated fairly, are imbued with a sense of purpose, and are provided with a full measure of recognition.2 The fourth rule of equity ensures that equity follows engagement, not vice versa. As the above rules suggest, equity is a powerful — but not a default — tool. 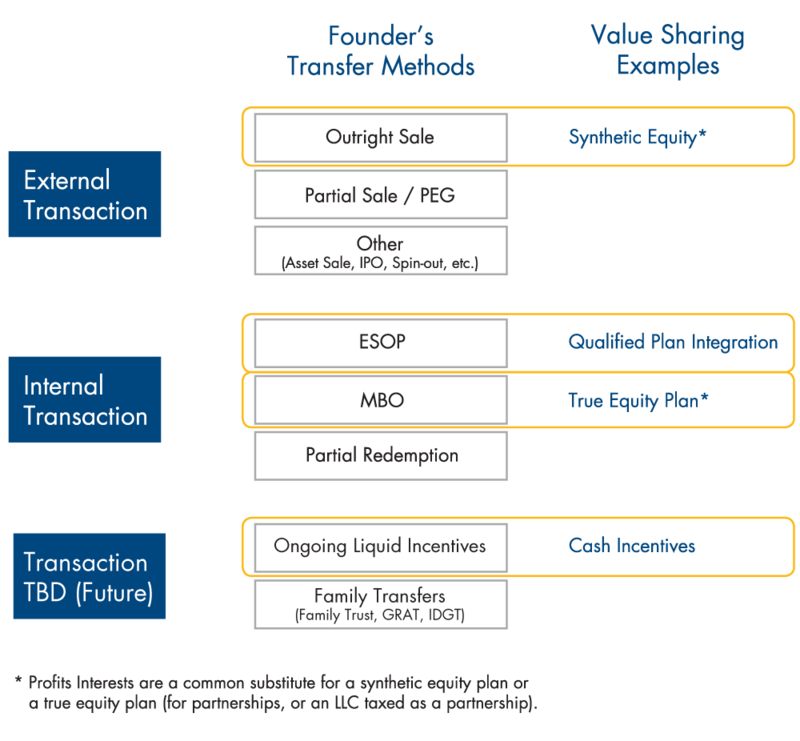 When equity is central to the portfolio of incentive solutions, owners, founders, and boards can seek to master the art of equity transfer — including how and when to sell equity typically via an installment note, pay equity as a compensatory bonus, or convey equity at no cost to the executive. To achieve this, we use the Sell·Pay·Convey decision framework to design robust, self-correcting equity models (see Exhibit 2). When leaders of middle-market companies seek to establish or improve their equity models, they often are presented with off-the-shelf solutions and boiler-plate agreements. Then, after investing a great deal of effort in modifying those solutions and agreements for their situations, they may discover that the equity instrument is not the best one for navigating their unique set of equity inflection points. Sell·Pay·Convey is a sound foundation for understanding and analyzing equity transfers. Pay: The second method for transferring ownership is to pay new owners a stake in the company. Think of this choice as a performance reward that is governed by an if/then proposition. For instance, if the executive team of a company exceeds budgeted goals by 10 percent, it will receive a $1 million compensatory stock grant. Convey: The third method for transferring ownership is to convey an entrepreneurial opportunity in the company’s future with no out-of-pocket cost to executives. For instance, an executive is given a compensatory stock grant plus a cash bonus to pay the tax on the grant. Sell·Pay·Convey is a sound foundation for understanding and analyzing equity-based transfers. It helps articulate the meaning of an ownership transfer—that is, the strategic and psychological goals behind it; the structure of the ownership transfer—that is, the rights and privileges that should define it; and the value of the transfer—that is, the financial value and tax consequences. There are many possible variations on the Sell·Pay·Convey spectrum—and they can be combined into self-correcting equity models to drive leadership excellence and achieve strategic goals. Sell-based equity transfers enable key executives to invest directly in a company. In buying a stake, executives align their financial interests with the company’s success in a material way—executives now have skin in the game. Affordability is one of the biggest obstacles to selling ownership. Our rule of thumb is that equity stakes should be priced between the cost of a car and a house. Less than the price of a car and there’s not enough executive skin in the game; more than the price of a house and executives cannot or will not buy. This sets the stage for a common problem in mature private companies that we call the buy-in paradox. The buy-in paradox occurs as executives grow the value of the company. The higher the valuation, the more expensive it becomes to buy in. Key executives become frustrated because they can’t afford to become material owners, so they leave. Then, business performance suffers, and company value falls. Finding solutions to the buy-in paradox is essential for professional services companies. Valuation discounts: Controlling shareholders can apply minority discounts (as well as limited rights) to key executives when they draft shareholder and operating agreements. These discounts, which are typically 35-50 percent, make the buy-in more affordable, and limit risk for both parties. 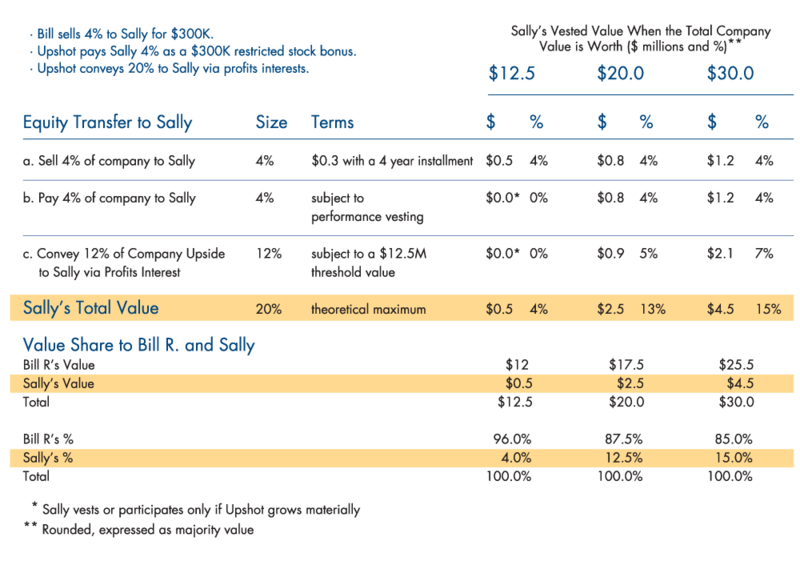 Affordability financing: Founders can lower buy-in barriers by offering attractive financing terms. For instance, a key executive can be offered a five-year balloon note, which provides her with the opportunity to harvest the cash needed to pay for the buy-in through distributions. Non-recourse debt: Founders can de-risk equity transfers by allowing key executives purchasing equity with a note to return all or a portion of ownership stakes without obligation for the underlying debt. For instance, a hybrid installment note could be 50 percent recourse and 50 percent non-recourse, and, according to many legal experts, the purchased equity may still qualify for capital gains taxes as property. Pay-based ownership transfers enable founders to reward key executives for superlative performance. The primary mechanism through which this is accomplished is a grant of ownership equity in lieu of cash. If the reward is for past performance, it may be granted without restriction. If the reward is meant to drive future performance, it can be subject to vesting. That is, the key executive may retain the stock only if certain conditions are met. This vesting can be predicated on service longevity, business results, or individual performance—or any combination of them. Compensatory stock grants: In essence, a compensatory stock grant is a bonus in the form of stock, with the executive paying the tax on the grant out of pocket. These grants make equity affordable and they may reduce undesirable risk taking, because paying the tax gives executives some skin in the game. Restricted stock grants with 83(b) election: A restricted stock grant is a promise to a key executive, who receives full ownership only after the vesting requirements are met. In the case of an 83(b) election, the executive can prepay the tax on an equity transfer prior to vesting, which significantly lowers the tax liability, makes the equity more affordable, and still entails some skin in the game, because the tax is not refundable (even if vesting never occurs). Nonqualified stock options (NSOs): Assuming a growing company value, NSOs enable an executive to buy the shares at a predetermined strike price below the FMV (fair market value) at time of exercise. Nonqualified stock options offer a high degree of design flexibility. One example is "cash-less" NSOs, which permit a net exercise in the form of cash or shares based on the value of the upside. Assume an executive has 10 NSOs at an exercise price of $10 per share and FMV of $20 per share — with a total in-the-money value of $100. A cash-less net exercise will permit the executive to receive five shares at $20 per share without any out-of-pocket exercise price (although the executive will be required to pay ordinary income tax on the bargain purchase element of the NSO exercise). Too often, owners are unaware of their value-sharing alternatives and default to the limited selection of public company options. Convey-based ownership transfers offer key executives a tax-free financial share in the business at no cost. Unlike sell and pay transfers, these transfers provide the greatest leverage to business executives who take calculated risks and succeed. They are the ultimate benefit for a select few executives. Profits interests in a partnership: 6 Profits interests take advantage of a unique provision in the tax law that enables partnerships (and LLCs taxed as partnerships) to offer zero-cost ownership grants that operate as true equity for any increase in value. Most legal experts agree that after a two-year holding period, they are taxed as capital gains. In addition, profits interests feature a high degree of design flexibility in terms of vesting, profit allocation and value upon liquidation. Stock bonus with a tax true-up: By adding a cash bonus to stock grants, owners of companies with sufficient taxable income can execute an ownership transfer at no cost to a key executive or to the company. For instance, a company can offer a $60,000 stock grant and a $40,000 cash bonus to cover all taxes. The executive has $100,000 in income and uses the cash bonus to pay the resulting tax. Meanwhile, the company deducts $100,000, resulting in a $40,000 tax benefit. Neither party incurs a net out-of-pocket cost. (Taxation assumed to be 40% for company and executive). The examples above illustrate the kinds of solutions that the Sell·Pay·Convey decision framework offers. However, the full power of the framework is only revealed when it is used to bundle solutions to accomplish multiple objectives—simultaneously getting key executives to put skin in the game, rewarding superlative performance, and encouraging them to behave as entrepreneurs. To see this in action, we can revisit Bill R., the founder of Upshot Engineering (introduced on Page 2). Bill asks one of his advisory board members, Sally H., to join the firm as its chief growth officer. Sally, who would have to abandon her consulting business, is interested, but only if the offer includes a significant equity stake in Upshot. Bill is willing to sell Sally a 20 percent stake in the $12 million company. The problem: the stake is valued at $2.4 million, but Sally is unwilling to invest more than $400,000. Bill will sell 4 percent of the business to Sally for $300,000 6 —a figure based on an independent valuation and a 40 percent minority discount. Sally will pay $75,000 down and the rest in equal installments of $75,000 from her annual bonuses over the next 3 years. Upshot will pay Sally 4 percent of the business as a $300,000 restricted stock bonus, subject to her promotion to President and specific business metrics. Sally makes an 83(b) election and prepays $120,000 in tax, thereby locking in the total tax bill on these restricted shares. Upshot will receive $300,000 deduction and will use the tax benefit it receives to provide Sally with a half recourse/half non-recourse loan to pay that tax. Upshot will convey 20 percent of the upside of the business to Sally via a grant of profits interest. It costs Sally nothing, and has no value unless the company’s value increases. However, Sally will receive 20 percent of the growth above the current $12.5 million value of Upshot. The Sell·Pay·Convey equity model that not only convinces Sally to join Upshot Engineering, but also motivates her to perform at full capacity. It requires that she make an affordable investment in the company, giving her skin in the game. It provides her with an entrepreneurial interest in the company, without encouraging her to take undue managerial risks (see Exhibit 3). The best practice is to treat equity transfer as a part of the company’s strategic fabric, not a one-off transaction. Like all ownership transfers, Bill and Sally’s agreement will need to be fully implemented. Buy-sell terms must be integrated into governing documents to specify liquidity triggers such as separation, death and/or executives’ put rights. Equity pricing terms, including discounts, need to be specified in advance via either an annual valuation or some predetermined formula. Ongoing plan administration must be defined to reinforce the benefits of the plan to key executives. And the plan should be updated periodically with a holistic advisory team to address issues from behavioral motivation to changing tax laws. The best practice is to treat equity transfer as a part of the company’s strategic fabric, not a one-off transaction. Equity inflection points triggered by affordability, competency, and succession challenges can come in rapid-fire succession in middle-market companies. But owners shouldn’t respond in a knee-jerk way by immediately offering equity to lock in the key talent so critical for business success. They also should avoid the temptation to accept off-the-shelf solutions, which often do not adequately address the behavioral and risk profiles of owners, executives, and private companies. Instead, owners should default to the five Equity Rules and then, use a qualified team of advisors and Sell·Pay·Convey to design an equity model that best serves their needs and their companies. In doing so, they can design a balanced solution. Better yet, they can be strategic and explore their options in advance. Owners who proactively address equity inflection points rarely face equity crises. 1 Noam Wasserman and Thomas Hellman, "The Very First Mistake Most Startup Founders Make" Harvard Business Review, February 23, 2016. 2 Alexander Pepper and PwC, "Making Executive Pay Work, The Psychology of Incentives," 2012. 3 Chris Zook and James Allen, authors of "The Founder’s Mentality: How to Overcome the Predictable Crises of Growth" Harvard Business Review Press, 2016, define it as "an insurgent’s mission, an owner’s mindset, and obsession with the front line." 4 Jim Gilreath, “Skin in the Game: No Longer Just a C-Level Employee” (Made for Success Publishing, 2016). 5 Wm. Gerard Sanders and Donald C. Hambrick, "Swinging for the fences: The effects of CEO stock options on company risk-taking and performance" The Academy of Management Journal, October 2007. 6 Mark C. Bronfman, The Profits Interest: The Frank Lloyd Wright Approach to Ownership and Incentives . 7 The tax-free nature of such redemptions is subject to certain rules — including IRS section 302. Further, a partial redemption strategy may result in a lower enterprise value depending on how the redemption program is executed.